** 5 ACRES (approx. 219 feet wide by 1,000 feet deep) OF HIGH AND DRY PROPERTY WITH A 3 BEDROOM, 2 BATH SINGLE FAMILY HOME **. The metal roof. central air conditioning, insulated windows and septic system all replaced in the last 5 years. Plenty of room for gardening, horses, pets, big boy toys and more. Front part of the property is fenced with chain link. Plenty of parking space for all and a side shed roof for boat etc. This home has an open floor plan that flows well for entertaining. The living room offers a beautiful brick real fireplace with mantel. The large well lit kitchen offers all wood cabinets with an abundance of counter space as well as a large island. The split bedroom floor plan provides privacy for the master bedroom which has its own private bathroom. Front porch and rear screened patio are generous in size. Exterior is up-graded concrete Hardi Board siding. NO Home Owners Association so no HOA fee. 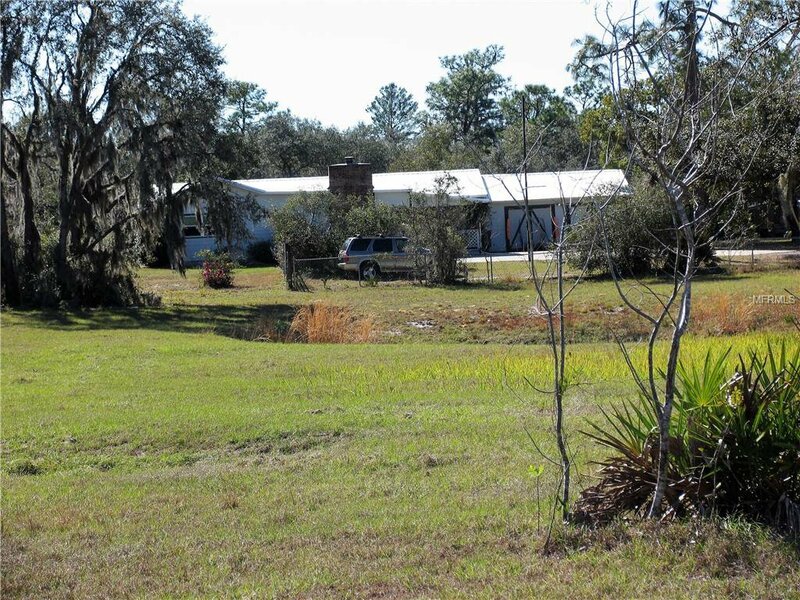 Home sits approximately 1/2 way in the total depth of the 5 acres. This home is on a private dirt road with concrete driveway. Great central Florida location close to Lake Walk in Water and Lake Kissimmee for fishing and boating. 10 minutes from Shopping, Walmart, restaurants etc. Horses allowed. Call today before it gone! Listing courtesy of JUDY B CLEAVES PROPERTIES INC. Selling Office: JUDY B CLEAVES PROPERTIES INC.